CUESA’s Volunteer of the Month program recognizes the dedication and work of some of our most active volunteers. CUESA relies on volunteers to help with education programs, special events, public outreach, and other activities that help fulfill our mission to cultivate a sustainable food system. Learn more about volunteering and sign up here. We’ll be hosting a new volunteer orientation on September 5 at the Ferry Building. 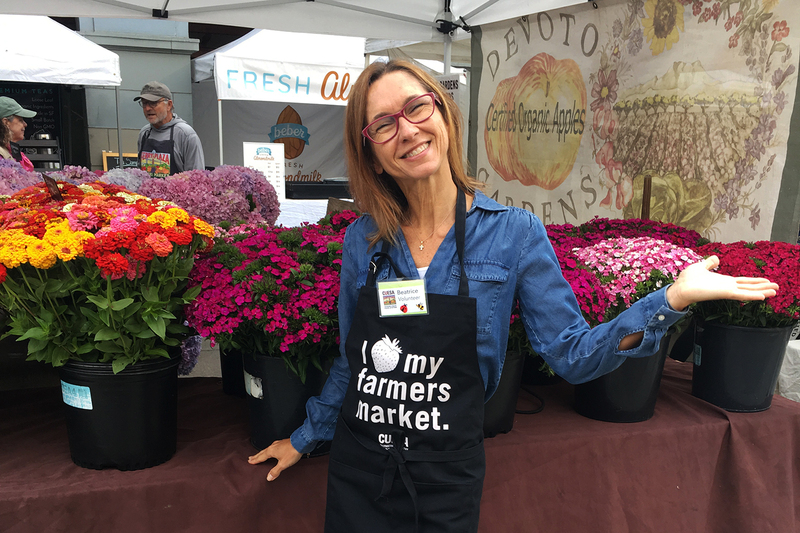 Memories of and love for the Italian markets she grew up with brought Beatrice Meredo to the Ferry Plaza Farmers Market. Her appreciation for local and seasonal food and the community it creates inspired her in 2013 to volunteer with CUESA, even though she knew almost nothing about the organization. Early in her volunteer tenure she supported the culinary programs, and now you’ll occasionally see her at a cocktail or fundraising event. More often than not she’s at the Saturday information booth helping locals and visitors alike. “Beatrice has a warm and helpful presence and is great with all kinds of people, says Market Administrator and info booth manager Katy Burnett. “I appreciate her willingness to pop into the schedule in emergencies as well as her deep knowledge of food.” Meet Beatrice. Beatrice: As an Italian, it’s something that comes naturally and from family. I’ve been around natural food my entire life, and I learned a lot from my grandma….the famous “Italian nonna”! She would cook very simple food, but everything was from scratch and very delicious. A lot of my food memories are actually linked to my nonna. Beatrice: I’m a personal chef, and for a few hours a week you can find me at Gio Gelati, an Italian gelato shop that recently opened in the city. I also love to hike, read, and travel. Beatrice: Being surrounded by people that ultimately share my same passion for food and that believe in the power of real food, especially organic. I love seeing families with young kids that shop together and that are probably raising future healthy eaters. I also love to see how the farmers and city dwellers come to gather for a common experience and appreciation for the food and produce. Beatrice: Talk to your farmers, get to know them, and ask them about their produce, especially if it’s something you are not familiar with. My favorite market item right now is stone fruit in general. Although during summer time everything is so delicious!